Virtual worlds draw folks from all sorts of religious, cultural and political backgrounds. And the more broad-based they become, the more diverse they'll be. As an example, today I found the "Traditional Marriage Support Center" in Metaplace, created by user HoneyBeeRose. The info desk helpfully defines "traditional marriage" as "a marriage between one man and one woman, as defined by God in scripture." A slideshow displays various various Bible verses about marriage, and a picture helpfully shows a man and a woman kissing to help illustrate what traditional marriage looks like. I was actually not aware that traditional marriage needed any particular support, since this is the only kind that is officially sanctioned by most governments of the world. I also have to wonder how HoneyBeeRose plans on supporting traditional marriage in her world. Will their be regular support groups there? Will there be debates between proponents of different kinds of marriage? Perhaps there will be links to resources for people thinking about living in sin or fighting against gay marriage legislation. We'll have to see. 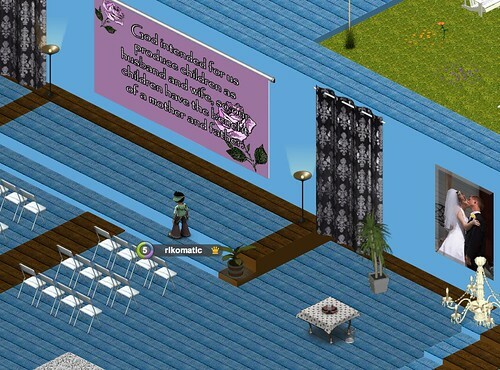 Since anyone in Metaplace can create their own world, I suppose that doesn't prevent someone from creating a "Nontraditional Marriage Support Center" or a "Polygamy Support Center." Note that there is also the "MetaEquality Center" in Metaplace for gays, lesbians, bisexuals and transgendered folk to feel welcome. Hey, thanks for visiting our world. 🙂 HoneybeeRose is actually my wife and the woman in the wedding photo. Our world purpose was mainly to speak out as an alternative voice to the attempts to redefine the definition of marriage. It will also have resources on abstinence and pro-life information. We are a Christian couple, and hope to be a voice that spreads God’s message of love instead of the political voices of hate and anger. thanks for sharing! I’d love to hear how your efforts go! Hi, rikomatic. Here in the United States homosexual men and women have been very politically active and trying to change national and regional laws to officially and legally recognize marriage between homosexuals. Voters in many states have passed laws either recognizing homosexual marriage or not and voters in some states have passed amendments to their constitutions to define marriage as the union of one man and one woman only. The voters in my state did this and political action groups dedicated to homosexual marriage have been trying to get the courts to declare it illegal. Some homosexual people in my state were very angry when their side lost the election. People who had publicly supported the constitutional amendment were forced out of their jobs by threats and harassment, churches were vandalized, people’s lives were threatened and their cars and homes were damaged. As a supporter of the amendment, I witnessed some of this and was a victim of some, myself.